Glucose syrup is a liquid sweetener used in a lot of candy making. Unfortunately, it is incredibly thick which makes it difficult to measure. Imagine corn syrup except about three times thicker. When I measure it, a lot tends to get stuck on the spoon (or more often spoons) and then even more gets lost in the bowl I use to measure it. Are there any tricks to measuring thick syrups and other difficult ingredients? Another option is to get one of the plunger type measuring cups. Once you push out the ingredient, you can use a spatula or spoon to scrape the end of the spatula. This works great for honey, molasses, syrup etc. Put the bowl on a scale and put the difficult ingredients directly from their packaging into the bowl. That way, you don't have to clean up any measuring utilities and waste no ingredients. Concerning "difficult" ingredients and measuring volumetric amounts with a scale: You only have to measure volumetrically ONCE! Once I know that my honey weighs 20 grams per tablespoon (I tared the scale with the wax paper, the measuring spoon and the lid that I used to balance the spoon) I can take that weight and run with it. 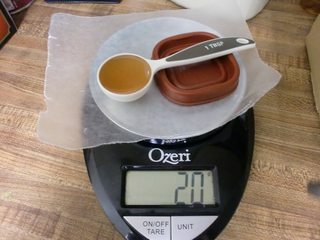 1 cup of my honey will weigh 320 grams. 1 teaspoon will weigh 7 grams (my scale doesn't do fractions of a gram). I never again have to dirty a cup or a spoon to measure honey unless I buy a dramatically different product, then I'll double check the weight of that honey with a tablespoon. King Arthur Flour has a pretty good chart for converting all kinds of ingredients from volumetric measurements to weights Master Weight Chart. It doesn't always completely mesh with my findings, but you're probably less likely to go wrong relying on it than measuring a "difficult ingredient" volumetrically over and over again. Spray whatever you are going to measure it into with pan release (Pam) first. Or if you don't have that, rub it with a tiny amount of vegetable oil. You can do this whether it is the bowl for the scale as eckes rightly mentioned, or a measuring cup. Same trick works with molasses and honey. Besides the methods already mentioned, you can also measure by displacement if you're working with volumetric measurements and one of the other ingredients to be added at the same time is a liquid -- use a measuring cup large (and precise) enough for both measurements, add the liquid first, then add the stickly item until the liquid is pushed up to the measurement necessary for them both together. Of course, if the sticky item floats, then you'll need to push it down with something. If there's a lot of liquid vs. the sticky item, you can always just use some of the liquid, so you can use a small enough measuing device with precise enough markings. Not the answer you're looking for? Browse other questions tagged measurements syrup or ask your own question. Does liquid glucose contain as much fructose as high fructose corn syrup? Do I use pure glucose or sugar syrup for making a caramel filling for a cookie?